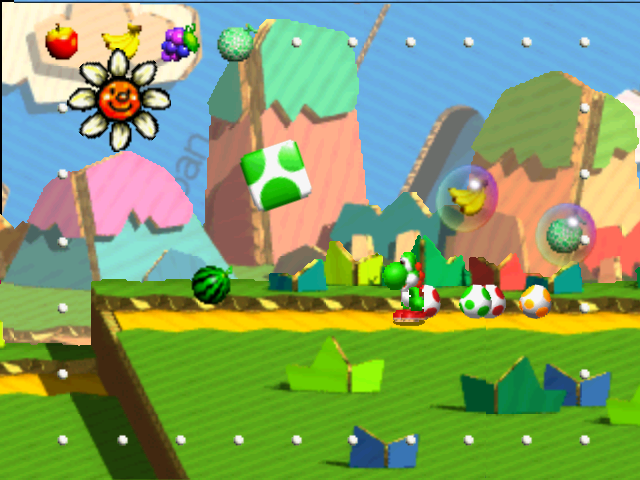 Frame buffer emulation is a set of techniques, which developer of hardware-rendering graphics plugin uses to emulate manipulations with color and depth buffer areas on the real console. This is one of the most important and hardest to implement part of the plugin. It is important, because many games uses manipulations with the buffers and will not work correct without it. It is hard because it is necessary somehow substitute the buffers in console memory by the content of frame buffer in PC video card. This is the introduction topic, where I will show you variety of ways of manipulations with color buffers used by N64 programmers to implement special effects. Primitive emulation of main frame buffer is quite simple: render frame, load frame buffer content from the video card, scale it down to the original resolution and copy to the proper place in RDRAM. 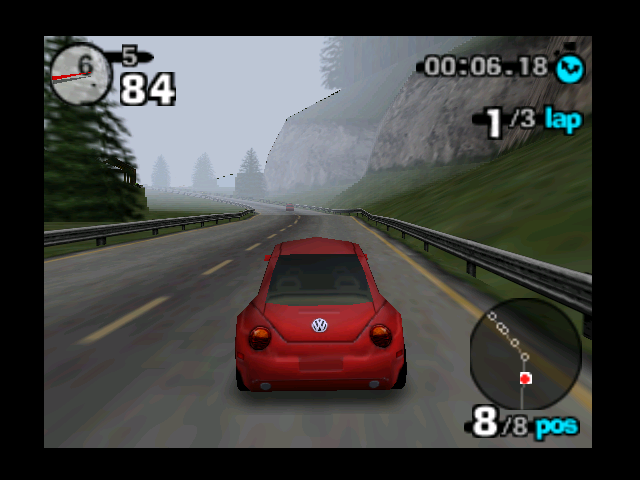 Since textures are loaded from RDRAM, it will work. It is not hard to read an image from RDRAM and render it on screen. The problem is that graphics plugin implements RCP and when CPU bypasses RCP it bypasses the plugin as well. That is plugin does not know when it must stop waiting for display list and switch to RDRAM reads. To do that trick the main color sprite is blended with another special sprite, which defines color intensity of the main sprite. That special sprite is color-indexed texture. Color of that texture is taken from its palette. 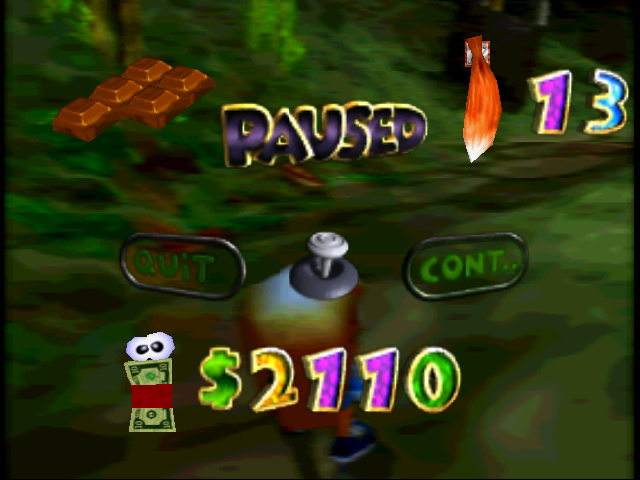 Palette is loaded into texture memory along with the texture, and texture's texels are indices in the palette. 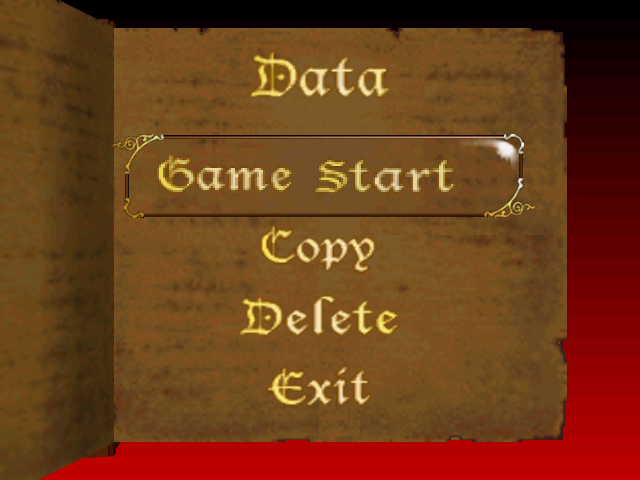 Usually palettes are part of game resources and loaded from the ROM, but palette for "2D lighting" texture generated dynamically using auxiliary frame buffer. Special texture of palette size is blended with two constant colors and rendered into the auxiliary frame buffer and then this memory area is used as palette for intensity texture. This effect was not emulated for very long time, because developers could not understand that non trivial behavior of the program. 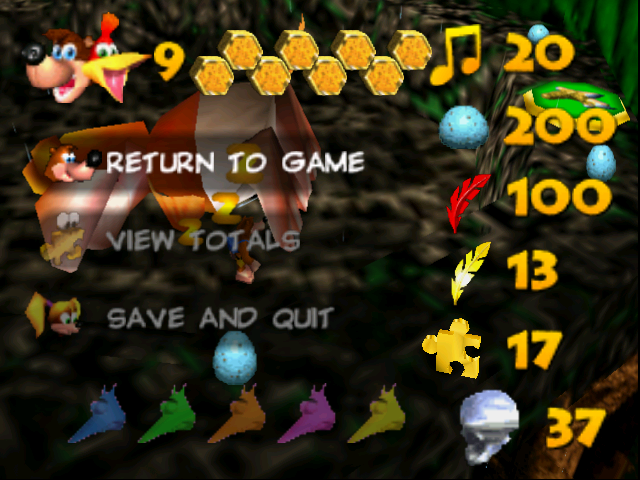 Usual frame buffer emulation techniques can't help to emulate it. 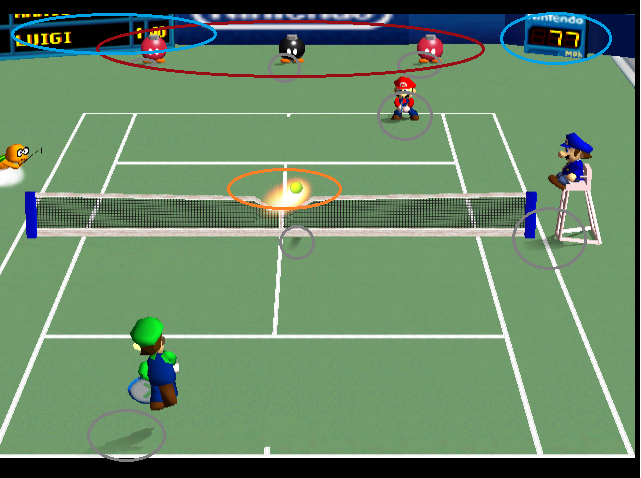 Score board in Mario Tennis is dynamically updatable texture. 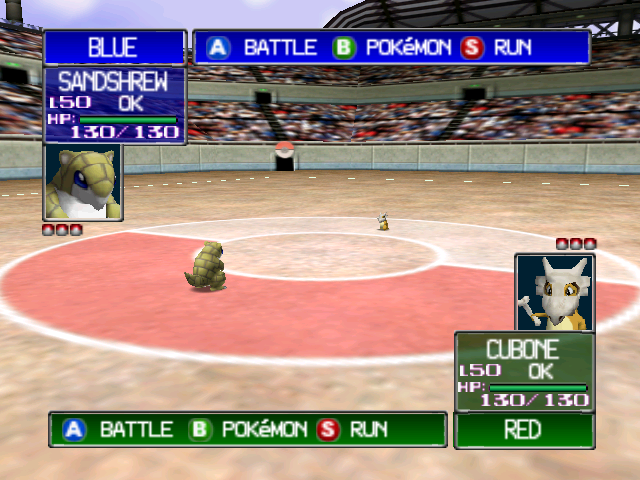 When text in the scoreboard need to be updated, the game creates auxiliary frame buffer at the address of the scoreboard texture and renders new text right into it. 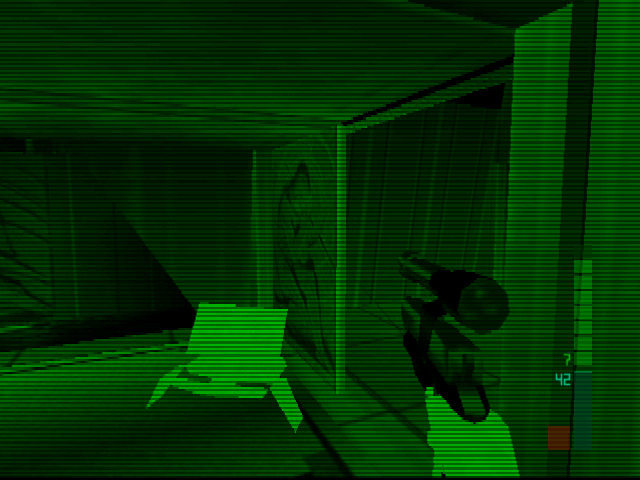 Then updated texture is applied to its object on the main scene. 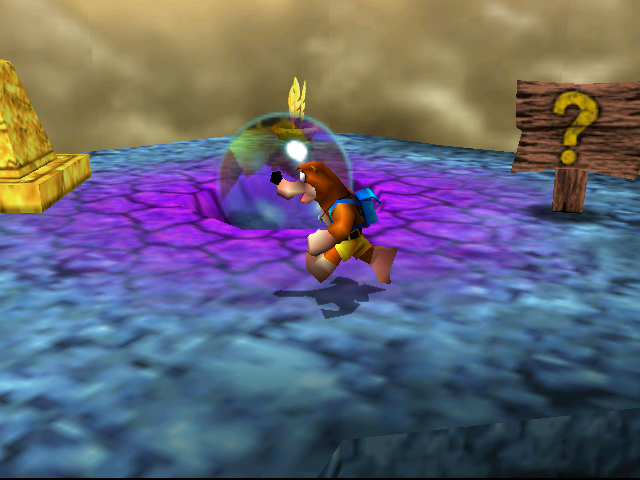 Dynamic shadows under each character and under the ball. Auxiliary frame buffers. Linesmen sprites first rendered into auxiliary buffers, then used in main scene. Ball hot trail with hot air effect. Complex effect. Several auxiliary buffers with the ball trail are blended with the main frame used as texture and the result is rendered back to the main frame. As the result the objects on screen are deformed under the ball and that looks like refraction of light in hot air. 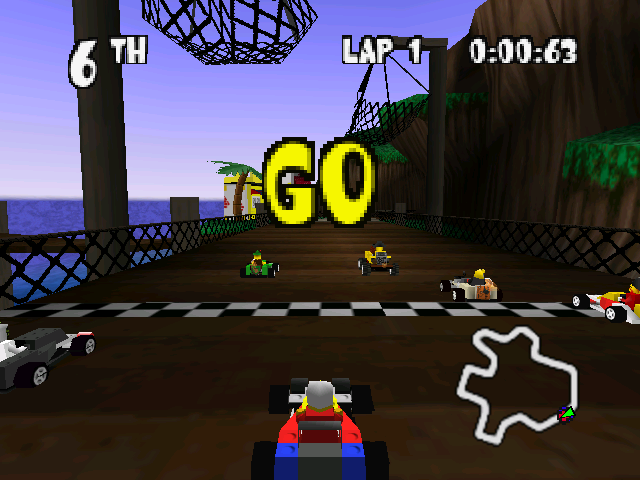 Score board and speed gauge – dynamically updated textures. And this is not all. 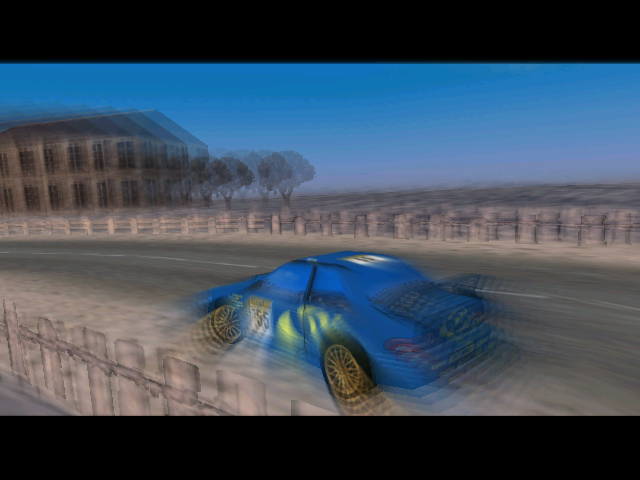 There are also many interesting effects in replays, including motion blur. 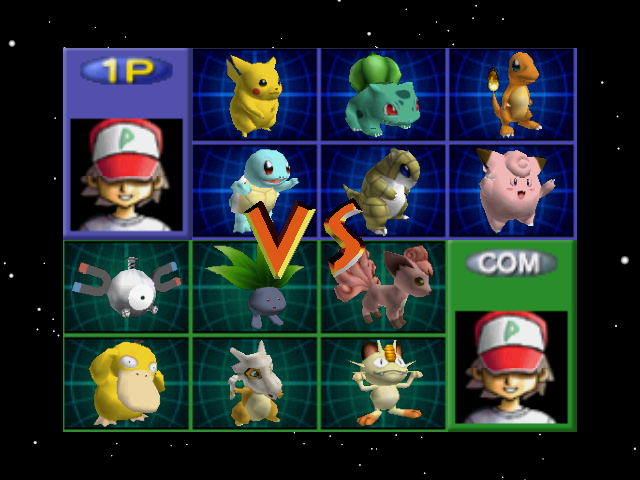 Now you see, why this game is so hard to emulate. Depth buffer format differs from any texture formats and its content does not used for rendering. Thus, graphics plugins usually just use depth buffer of the video card and do not care about depth buffer area in the RDRAM. However, in some cases filling this area with correct values is essential. Depth buffer copy. 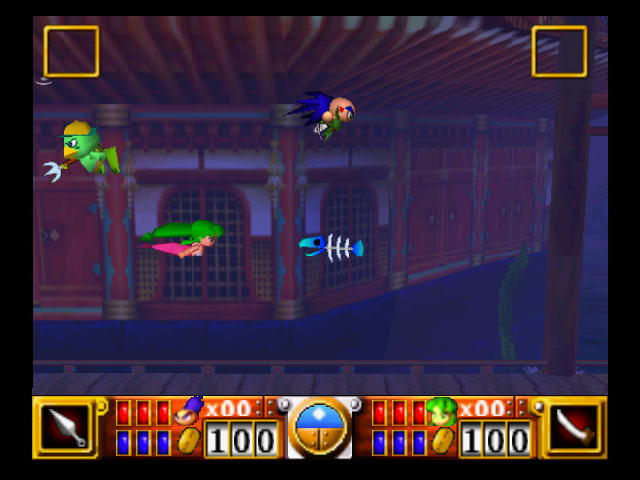 Few games use scenes consisting of 3D models moving over 2D background. Some of objects on the background can be visually "closer" to user than 3D model, that is part of the 3D model is "behind" that object and that part must not be drawn. For fully 3D scene problem "object behind other object" is usually solved by depth buffer. 2D background has no depth, and depth buffer by itself can't help. 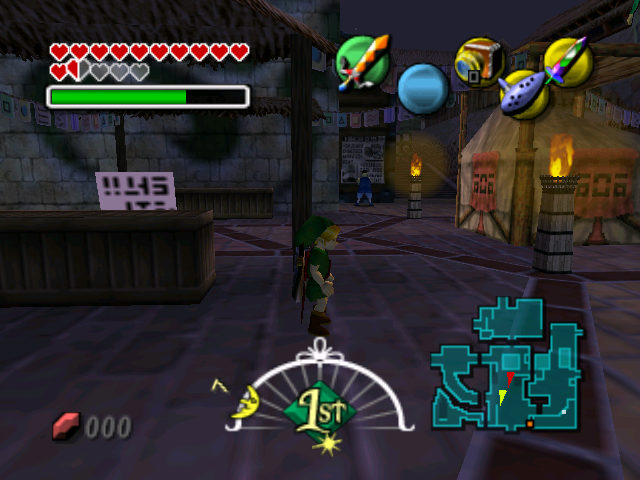 Zelda OOT solves that problem by rendering auxiliary 3D scene with plain shaded polygonal objects, corresponding to the objects on the background. Thus, the scene gets correct depth buffer. 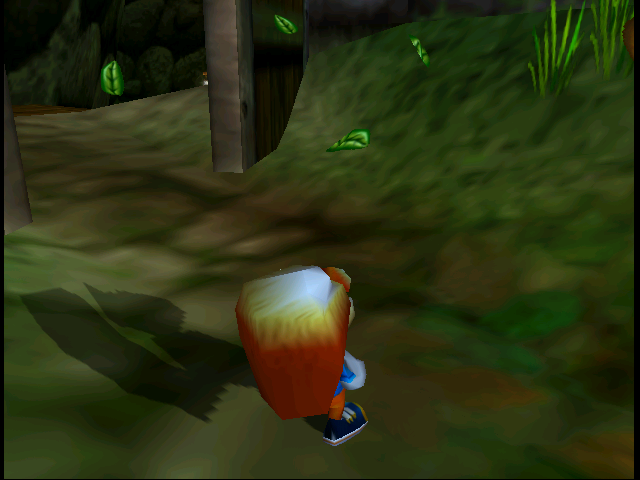 Then the background covers this scene and 3D models rendered over the background are cut by depth buffer when the models are behind the original polygonal objects. 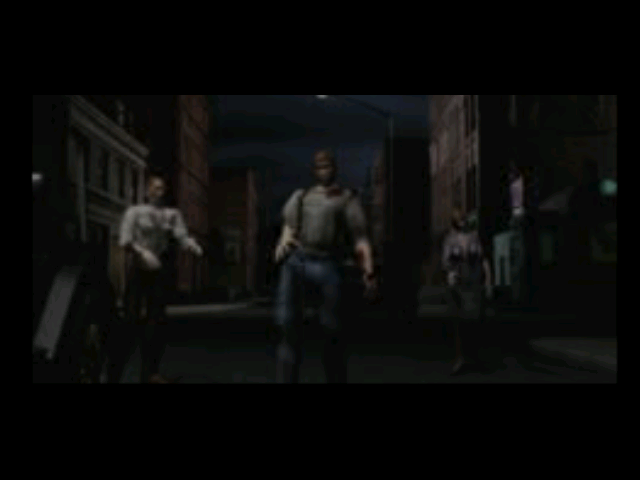 In Resident Evil 2 all screens are 3D models over 2D backgrounds. 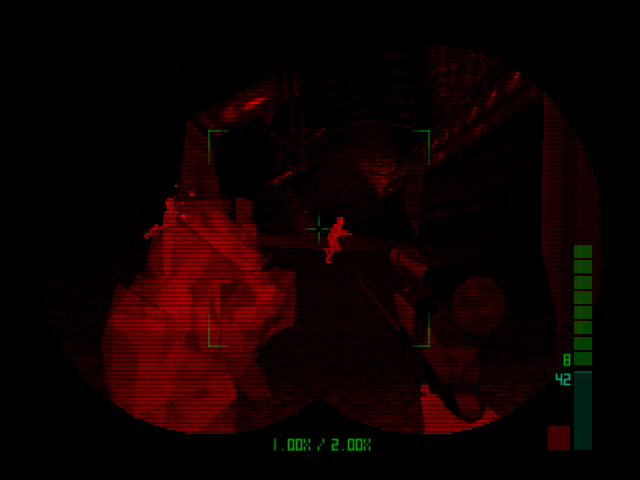 But the game does not render auxiliary 3D geometry to make depth buffer. 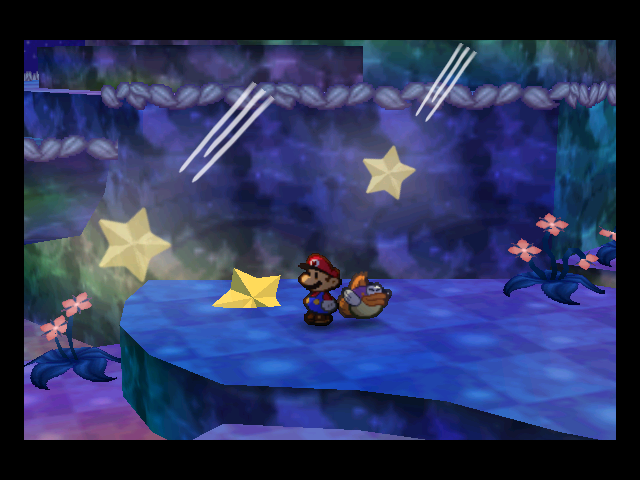 Instead, the game ROM contains pre-rendered depth buffer data for each background. That depth buffer data is copied into RDRAM and each frame it is rendered as 16bit texture into a color buffer which then is used as the depth buffer. To emulate it on PC hardware the depth buffer data must be converted into format of PC depth buffer and copied into PC card depth buffer. 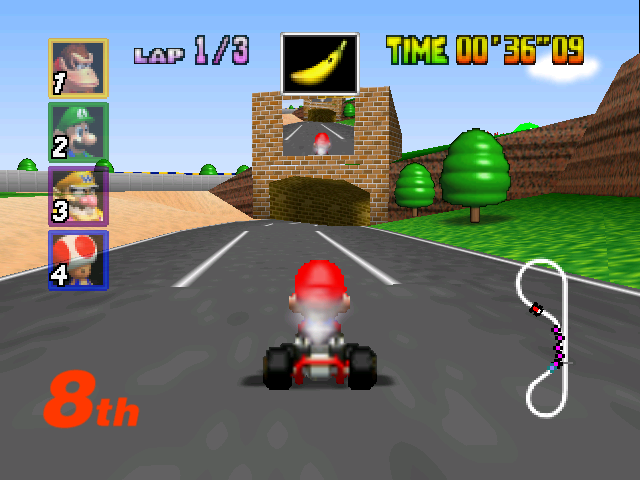 Emulation of VI effects directly related to frame buffer emulation. "It is not hard to read an image from RDRAM and render it on screen. The problem is that graphics plugin implements RCP and when CPU bypasses RCP it bypasses the plugin as well. That is plugin does not know when it must stop waiting for display list and switch to RDRAM reads." 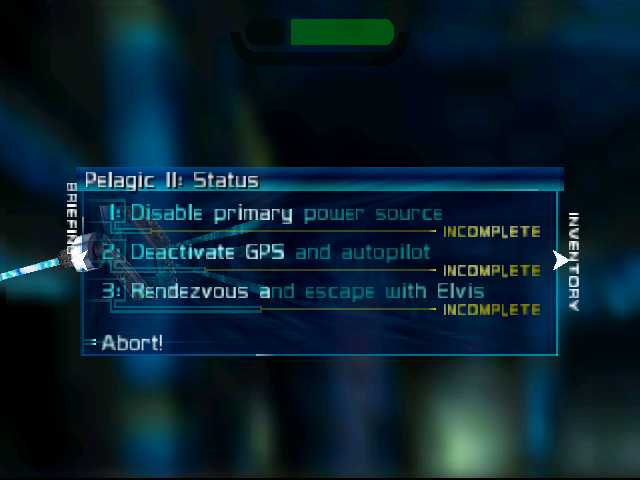 I never really understood why you N64 emu people think the "plugin system" mess is a good idea. If I understand you correctly with this quote, the plugin system seems to impose a completely virtual restriction on the emulation accuracy for virtually no gain (well, assuming that one regards all "advantages" of plugin systems as useless, like I do :P). 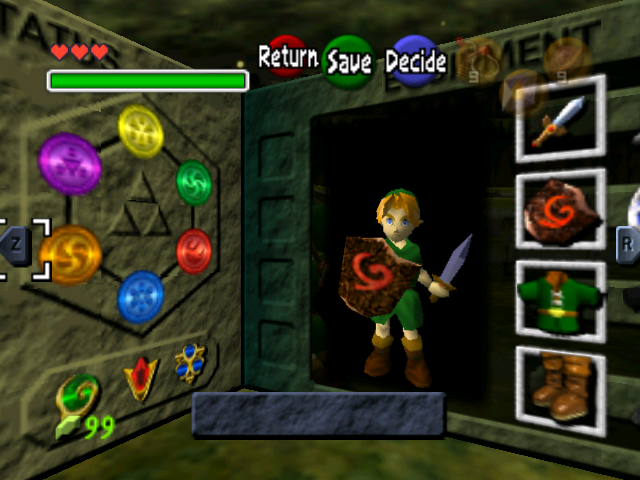 Plugin system perfectly fits N64 modular architecture. The problem here is in hardware rendering. Plugin gets command: display current frame buffer on screen. Software plugin will show frame buffer in RDRAM. If CPU will update it, the plugin will show updated content. Hardware plugin will show video card's frame buffer. Obviously, CPU module can't modify it. 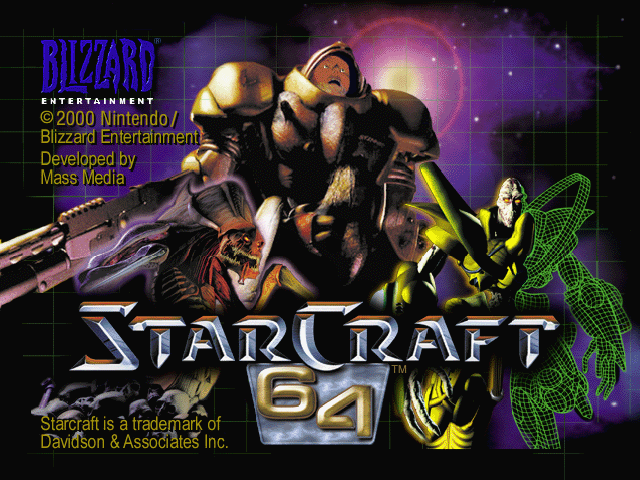 (I think) a lot of the reason N64 emulators use plugins is because of two main reasons: PJ64 was the first emulator to receive a great deal of recognition by the general public which used zilmar's plugin spec and allowed independent authors to contribute their own works for graphics, sound, input, and rsp without being directly involved in a project. It wasn't long before all mainstream emulators adopted this spec (1964, Mupen64, Apollo64) and all plugins were designed around it. Which leads to the second reason: there was never really a time where all of the most experienced n64 emu authors collaborated their efforts into a single project. To my knowledge they shared information and ideas, but mostly worked independently. Most projects remained closed source for a long time, and some still do. 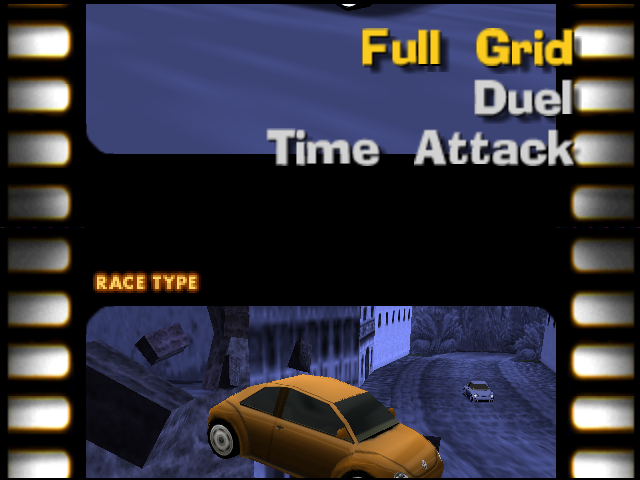 And because of this, current open emus like mupen64plus still use plugins because there has been no real progress in HLE graphics since Glide64, and some older plugins are still needed where Glide64 fails (like when games currently need LLE plugins like z64gl). 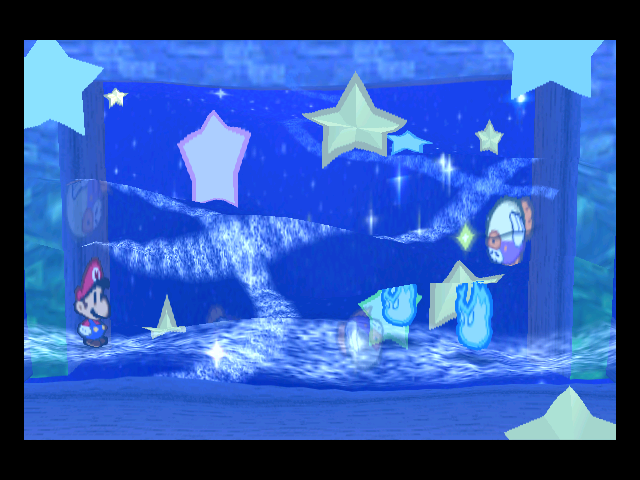 It would be great to see one big HLE n64 project like Dolphin and PCSX2, but I doubt it will ever happen. Most eyes and ideals atm seem to be focused on cycle accuracy (like cen64 by MarathonMan) which will be slow for a long time and lack HLE features. Concerning depth buffer emulation, you might want to emulate depth buffers as a RW (read-write) buffers (d3d11 terminology, no idea how they're called in ogl). That should give you more freedom in the format handling, etc. Shouldn't be all that hard, the worst part would be getting familiar with RW buffers and implementing depth testing from scratch in your pixel shader. Thanks for the hint! 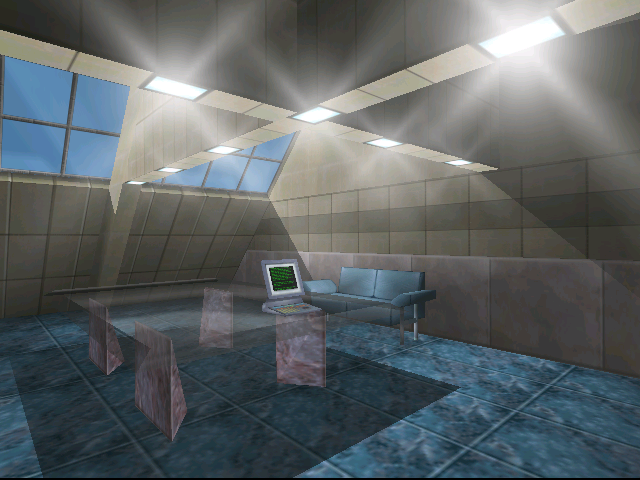 It is also possible to use renderbuffer with attached texture. I do not start that part yet, will see what is more suitable. 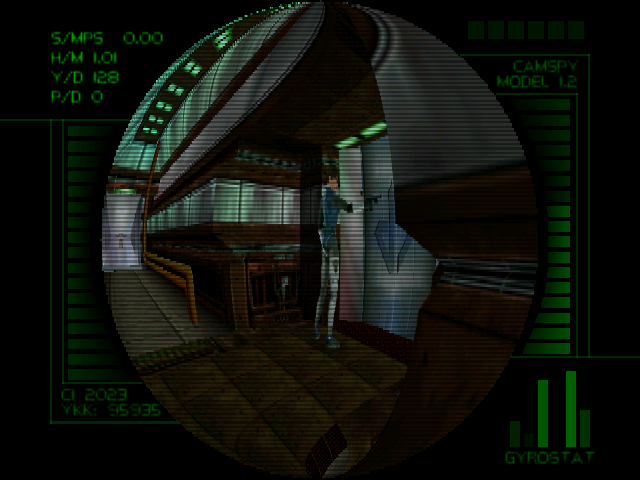 Thus, ogles version will not get depth buffer emulation. Pity. I'm not sure if this pertains to the Frame-buffers, but I could have sworn the dividing net in Mario Tennis had a shadow. So is this going to be opensourced or is yet another glN64 fork going to get its source hogged again like seems to be the trend in the N64 scene? All I can say is that every screenshot on this page is breathtaking. 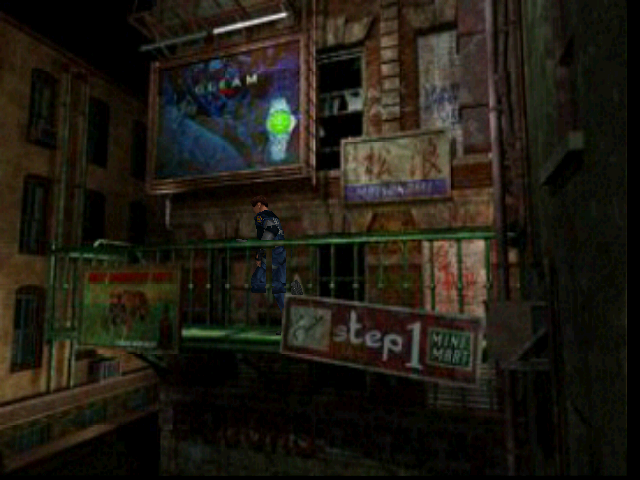 Almost all screenshots are taken with Glide64. Lots of work need to be done to achieve that level of compatibility with GLideN64. 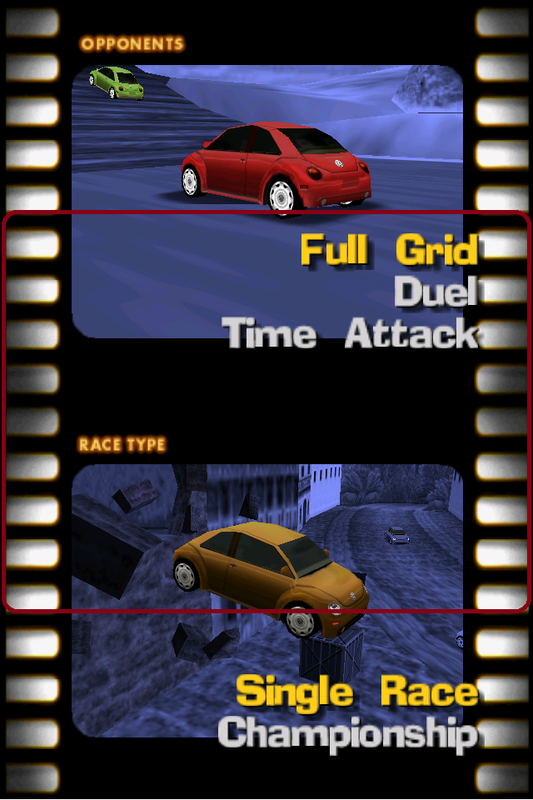 This VI emulation is more or less the same things for Top Gear Overdrive menu, no?